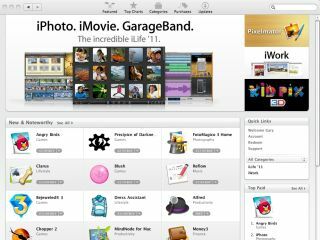 Apple's Mac App Store has been with us for just 24 hours but keen internet types have already worked out a way to get paid-for apps from the store for free. Although the app marketplace employs DRM technology to stop this kind of behaviour, the hack can be used to bypass the system on some apps. The hack involves fooling a premium app into accepting receipts from a free app by simply copying and pasting a few lines of code, thus making it look as though the user has receipts for the paid app. Not all paid-for apps suffer the loophole, but many do; pirates are particularly enjoying Mac-based Angry Birds without paying a penny. The technique only seems to work on apps that have validation procedures either missing or wrongly coded; either way, it's a workaround that Apple and developers alike will be keen to obliterate. News of the hack puts a certain damper on Apple's proud announcement that one million apps have been downloaded since the desktop App Store's launch yesterday.